Like most journalists, I own a voice recorder for recording interviews. Mine is pretty basic. I think it cost me around $30 on Amazon. But for the most part, I've been satisfied with it. I've never felt the need to upgrade to something a bit more powerful. But this new Android-powered voice recorder from Philips is making me question that. The Philips SpeechAir was developed by Speech Processing Solutions - Philips' Austria-based subsidiary which focuses on dictation products - and is aimed at legal and medical professionals. At first glance, it could be easily mistaken for a smartphone. Unlike most digital voice recorders, it comes with a 480 x 800 pixel IPS touchscreen which supports over 16 million colors. This is protected by Corning Gorilla Glass and a rugged, antimicrobial housing. It even has a 5 megapixel rear camera, which can also be used to read barcodes. 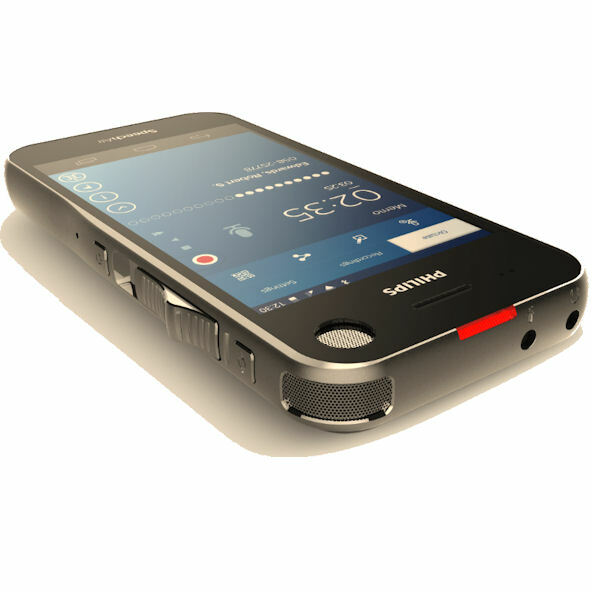 The gadget's case includes physical buttons, a slider, and an oversized microphone grille to support its primary function. It runs a heavily-customized version of Android 4.4.2. Powering the device is a dual-core Cortex A9 CPU, which comes clocked at 1.6 GHz. It also boasts 1GB of RAM, 16GB of internal storage, and WiFi and Bluetooth connectivity. The press release makes no mention of Google or the Play Store, so it looks like you won't be playing Angry Birds on your voice recorder. The SpeechAir also includes three different microphones, each suited for different tasks. In addition to the usual 360º microphone, used for recording meetings, it also includes a directional microphone for speech recognition, and a MEMS microphone for making VOIP calls. The package includes headphones, data and power cables, an international power supply, and a desktop docking station. Perhaps the biggest coup-de-grace of the Philips SpeechAir is its software. Not only does it automatically protect recordings with 256-bit AES encryption, but it can also be remotely administered. Philips has even released an SDK to allow developers to write applications for it. Of course, this functionality goes far above-and-beyond what the majority of voice recorders offer, and will undoubtedly come with a significant price tag, although Philips hasn't listed any pricing information. If you want to get one, you'll have to get it from one of Philips' local retail partners. VIENNA--(BUSINESS WIRE)--Speech Processing Solutions, the global market leader in professional dictation solutions, introduces the first smart voice recorder: Wi-Fi-ready, easy to use with touch screen and slide switch, as well as an integrated camera which can even scan barcodes. Perfect ergonomics and ultra-sensitive dedicated microphones meet all the demands of a professional and mobile voice recorder. “Philips SpeechAir unites the best of two worlds. It’s the missing link between the worlds of smartphones and dictation recorders,” said Dr. Thomas Brauner, CEO of Speech Processing Solutions. The users benefit from the flexibility of an Android product, including the familiar look and feel, a touch screen, a camera, as well as Wi-Fi and Bluetooth data transfer options. SpeechAir offers a variety of possibilities: mobility, multi-functionality combined with comfort and efficiency. And the dictation function? It’s certainly something to talk about with three precision microphones providing superior recording quality, ergonomic single-handed slide-switch control operation, remote administration, long-lasting rechargeable batteries for maximum performance and maximum data security through real-time encryption. The built-in camera is not just great for snapping quick photos, it also serves as a barcode scanner – ideally suited for various practice areas including health care. SpeechAir is designed to last, and its antimicrobial and shock proof housing with Gorilla glass make it suitable for the toughest environments. The device is equipped with the latest technology including three professional microphones that guarantee the best sound quality in every recording situation. The 360° microphone is ideal for recording meetings and dictations; the directional microphone helps cancel noise and is specifically designed for ambient-sound environments, while a third microphone allows VoIP phone calls. To ensure maximum data security, all SpeechAir recordings are encrypted in real time using AES, 256-bit. The device itself can be PIN or password protected, the camera can be locked, and access to Wi-Fi networks can be restricted. It’s easy to integrate Philips SpeechAir with other workflow solutions, such as hospital information systems or legal practice and case management software. Software and system developers can install their own apps, while users can configure SpeechAir to directly access patient and client data connecting it with relevant dictation recordings. 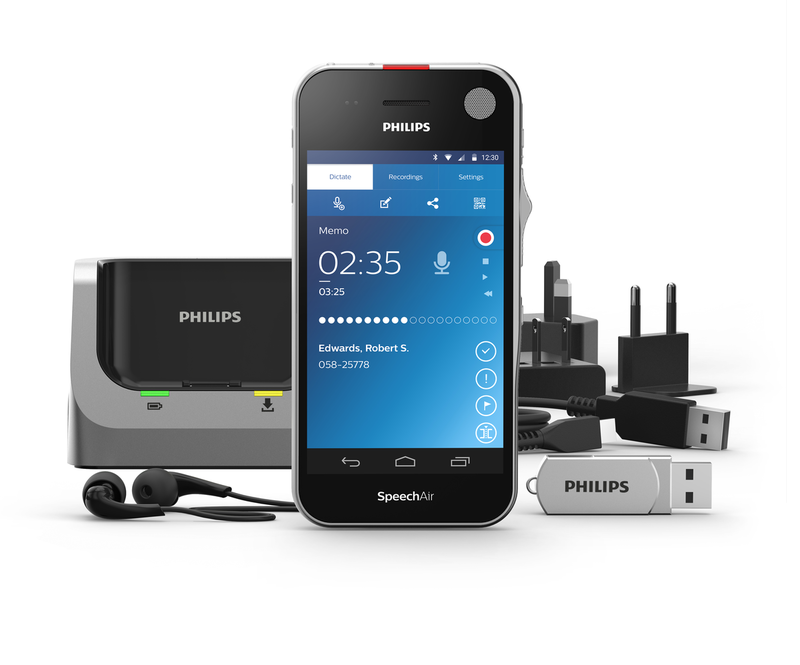 SpeechAir is ideal for combining it with other Philips workflow solutions, such as the Cloud-Service SpeechLive. Philips SpeechAir (PSP1100 and PSP1200) is available immediately at certified Philips dictation solutions distributors.